Loneliness is the unpleasant feeling that occurs when people perceive their social relationships to be deficient in a quantitative or qualitative way (Perlman & Peplau, 1981). Experiences of loneliness are especially salient during adolescence, when many changes in social relationships occur. Studying adolescent loneliness is important, not only because of the social pain it involves, but also because it is considered to be a risk factor for many mental and physical problems (Hawkley & Capitanio, 2015; Heinrich & Gullone, 2006). In the present dissertation we focused on three understudied topics. Specifically, we examined (1) different types of loneliness; (2) psychometric characteristics of a multidimensional loneliness measure; and (3) groups of individuals that may be especially vulnerable to experiences of loneliness. First, we focused on intimate loneliness (i.e., the feeling of lacking a close, intimate attachment to another person) and relational loneliness (i.e., the feeling of lacking a network of social relationships) as different types of loneliness. We identified one group of adolescents that felt intimately lonely (in relation to their parents), but not relationally lonely (in relation to their peer group), and another group of adolescents that felt relationally, but not intimately lonely. Moreover, we found that these groups of adolescents scored differently on several aspects of well-being. In another study, we specifically zoomed in on adolescent loneliness in the peer context. 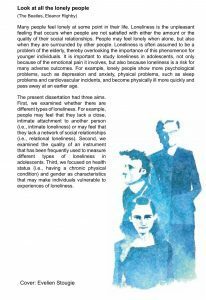 We included six established loneliness measures and specified which type of loneliness they tap into. Results again indicated that intimate loneliness (in the dyadic context of friendship) and relational loneliness (in the broader context of the peer group) could be distinguished. 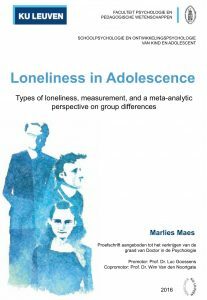 Second, we focused on psychometric characteristics of the Loneliness and Aloneness Scale for Children and Adolescents (LACA; Marcoen, Goossens, & Caes, 1987), which is a multidimensional measure commonly used with adolescents. We examined the reliability of scores obtained with the LACA in studies that have used this measure in different groups of adolescents. Moreover, we examined measurement invariance across gender, age, and cultural groups. Results indicated that the reliability of scores obtained with the LACA was good across the different groups studied, and that the items as well as the underlying latent factors of the LACA were interpreted similarly by boys and girls, by participants from different stages in adolescence, and by adolescents from two very different cultural groups. Third, we focused on health status and gender as characteristics that may make individuals vulnerable to experiences of loneliness. Using multilevel meta-analytic techniques, we found that children and adolescents with chronic physical conditions were, on average, somewhat lonelier than their peers without such conditions. However, it is important to keep in mind that individuals with chronic conditions constitute a very heterogeneous group, even within specific conditions. Regarding gender, we found that males and females across the lifespan were very similar regarding mean levels of loneliness. In sum, the present dissertation provided a meta-analytic perspective on types of loneliness, measurement, and vulnerable groups. In addition to addressing important gaps in the loneliness literature, the results of the present dissertation raised new questions. By providing avenues for future research, we hope to inspire others to extend our current knowledge and to move the field of loneliness research forward.